Clotilde von Derp, stage name of Clotilde Margarete Anna Edle von der Planitz (5 November 1892 – 11 January 1974), was a German expressionist dancer, an early exponent of modern dance. Her career was spent essentially dancing together with her husband Alexander Sakharoff with whom she enjoyed a long-lasting relationship. Born in Berlin, Clotilde was the daughter of Major Hans Edler von der Planitz (1863–1932) from Berlin and Margarete von Muschwitz (1868–1955). On 25 January 1919, she married Alexander Sakharoff, a Russian dancer, teacher and choreographer. As a child in Munich, Clotilde dreamt of becoming a violinist but from an early age she revealed how talented she was as a dancer. After receiving ballet lessons from Julie Bergmann and Anna Ornelli from the Munich Opera, she gave her first performance on 25 April 1910 at the Hotel Union, using the stage name Clotilde von Derp. The audience were enthralled by her striking beauty and youthful grace. 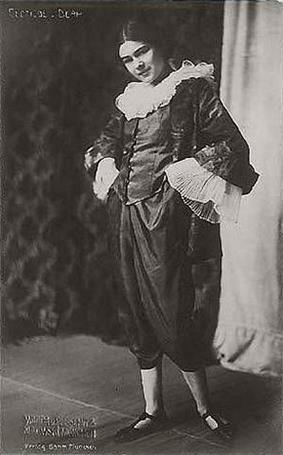 Max Reinhardt presented her in the title role in his pantomime Sumurûn which proved a great success while on tour in London. A photo by Rudolf Dührkoop of her was exhibited in 1913 at the Royal Photographic Society. Clotilde was a member of the radical Blaue Reiter Circle which had been started by Wassily Kandinsky in 1911. Among her admirers were artists such as Rainer Maria Rilke and Yvan Goll. For his Swiss dance presentations, Alexej von Jawlensky gave her make-up resembling his abstract portraits. From 1913, Clotilde appeared with the Russian dancer Alexander Sacharoff with whom she moved to Switzerland during the First World War. Both Sacharoff and Clotilde were known for their transvestite costumes. Clotilde's femininity was said to be accentuated by the male attire. Her costumes took on an ancient Greek look which she used in Danseuse de Delphes in 1916. Her style was said to be elegant and more modern than that achieved by Isadora Duncan. Their outrageous costumes included wigs made from silver and gold coloured metal, with hats and outfits decorated with flowers and wax fruit. Unlike her husband, Clotilde had a taste for modern music, frequently choosing melancholic music by contemporaries such as Max Reger, Florent Schmitt and Stravinsky. Her haunting eyes and delicate smiles gave the impression she took pleasure in displaying her finely-costumed voluptuous body, even when she reached her forties. She was particularly effective in interpreting Debussy's Prélude à l'après-midi d'un faune. Hans Brandenbourg maintained her ballet technique was superior to that of Alexander although he did not consider her a virtuoso. Clotilde also moved more independently of the music, dancing to the impression it created in her mind rather than to the rhythm. ^ Regarding personal names: Edle was a title before 1919, but now is regarded as part of the surname. It is translated as a noble (one). Before the August 1919 abolition of nobility as a legal class, titles preceded the full name when given (Graf Helmuth James von Moltke). Since 1919, these titles, along with any nobiliary prefix (von, zu, etc. ), can be used, but are regarded as a dependent part of the surname, and thus come after any given names (Helmuth James Graf von Moltke). Titles and all dependent parts of surnames are ignored in alphabetical sorting. The masculine form is Edler.